It’s January 31st! Where did time go? This month the challenge was to read contemporary romance from your TBR pile. I never realized this challenge would be so difficult for some people. We had 26 readers announce their intention to participate and 20 completed. I’m clearing the sidebar in preparation for February’s challenge, so a listing of participants and links to their reviews are provided below. I’m pretty impressed with the completion rate, actually. 20 people did this challenge…wow! I discovered that I didn’t love this challenge myself,I went through a couple of duds before I found a book I could actually get into and finish. I’m looking forward to February’s challenge, reading a new to you author. I’ll put the post up tomorrow, for sign-ups. Thanks to everyone who participated in the January challenge and for spreading the word! 20 of 26 participants completed! I’m still playing with some of the code. I can’t figure out why the blockquote code isn’t working. When I quote something, it’s supposed to have a lovely, different colored background. I did something and broke it so now it won’t do that. Please don’t ask me what. I don’t know. TO ADD: It seems the blockquote background color shows up in IE but not Firefox. Why? I have no freaking clue! Also, for those of you viewing in IE who saw things kind of squished, I worked on the template with Jay’s help and I think I adjusted the widths so it’s not crammed. I wish things didn’t look so different in the different browsers! I’m also looking at putting dividers between posts, but I’m not so sure about that either. I’ll have to keep playing with. Major props go to Mandy for helping me create the header and sidebar graphics. I picked out the picture I wanted to use and she did the rest, including the clever tagline of nice mommy, evil editor. She’s the bomb-diggity! I blogged a few weeks ago about the pilot episode of The Book of Daniel and how much I’ve been enjoying the show. Everyone I know who’s watched has enjoyed it. Well, after only three episodes it’s been cancelled. You can see the full story here. Laurie of Laurie Likes Books wrote an excellent blog today about this show and its cancellation. I’m not going to be as eloquent. I’m feeling mean and bitter so I’m going to be blunt. If you’ve never seen a show, walked in someone’s shoes or read a book, you have no business speaking out against it or them. None. I like to thing God can be more tolerant and accepting of people. Including acceptance of idiots like those of you who boycotted the show without knowing anything about it because you never saw one episode. Or left reviews of a book you’ve never read. Or condemned someone for a lifestyle you don’t understand. The people who have time to do things like that? Probably would be better off spending their time attending to their own lives. This morning, a little girl was shot by an 8 year old boy at a daycare, in an accident. He had the gun in his backpack and was playing with it. The article is here. GERMANTOWN, Md. (AP) – A gun brought to a day care center by an 8-year-old boy accidentally went off Tuesday, wounding a 7-year-old girl in the arm, police said. The boy had the gun in the backpack and was playing with it when it went off at the For Kids We Care center, Montgomery County (website – news) police spokesman Derek Baliles said. The girl was taken to Children’s Hospital in Washington, he said. Her injury was not considered life-threatening. There were six children in the center at the time of the shooting, which happened around 7 a.m. No one else was hurt. Police said they do not know where the child got the gun. Names of the children, both from Germantown, were not released. Police spokeswoman Nancy Nickerson visited the scene shortly after the shooting and said the children were watching television. “The day care provider there did an excellent job of keeping the children safe and secure and calm,” she said. Meanwhile parents whose children attend the day care center are stunned by the shooting. Many, like Jackie Tazwell, say they’ve never had a problem with the For Kids We Care facility. Tazwell says she’s concerned about the shooting. But, she says, the main thing is that the little girl who was shot is fine. The day care is located in a Germantown apartment complex. Neighbor Charlene Pearsall says a lot of residents use the facility and she’s never heard anyone say anything bad about it. In fact, officials say some of the kids were moved to another center owned by the same day care operator. For Kids We Care Inc. operates two medium-size daycare centers in Germantown, according to its Web site. Let me just say how completely shocked and apalled I am at this article. For the obvious reasons of a young girl getting hurt, yes, but why in the h*&* is the article making the daycare out to be the bad guy? How unusual is it for an eight-year old boy to play in his backpack? Not at all. Is it the daycare’s responsibility to assume the parents are so NEGLIGENT as to let a child not only have access to a gun but put one in his backpack. I am smoking mad at the irresponsible manner in which the news is reporting this. How about the outrage at parents that let their children play with dangerous weapons? I’m just sick to think the daycare is going to hold responsibility for this because of the fucktardedness of this boys parents. The daycare people shouldn’t be expected to have to say “no, no little Tommy, don’t play in your backpack, you might accidentally shoot someone with the gun you have in there” Wow. Our society is just…grrr… I guess they’ll end up getting sued for not doing weapons checks. I blogged a couple weeks ago about a Book Collector program that Mandy told me about. I was whining about how time consuming it was to put each book in by hand but that barcode scanners were too expensive. But I did end up getting one off ebay for $15. Even though it said it might not work exactly as I needed it to, I decided to take a chance and wheeeee! am I glad I did. This past weekend I used my new scanner to input my TBR books that are downstairs on my mini-shelf. By mini-shelf, I mean a shelf that’s actually meant to hold videos/dvds. It took me about 20 minutes to finish inputing the books with my barcode scanner (I’d started them by hand when I first got the program). The trick, I discovered, is to scan the barcode on the inside cover, not the back cover. Because sometimes it reads not the ISBN number on the back but the longer number. Don’t ask me why the two barcodes read differently, but they do. So, I got all of my downstairs TBR books inputted(with the exception of a box I just realized Josh hid from me unintentionally, a big box of around 20 books)–I have at least 150TBR books that I’ve accumulated since the beginning of July. That doesn’t include the box I forgot about that Joshua hid and all the books I got, read and either passed on or moved upstairs to my shelves. I would estimate at least 50 more. So in 7 months, I’ve gotten roughly 200 to 220 books. Works out to around a book a day. And I am clearly not reading even close to that. I was telling Jaci, after this realization of the books I have on my downstairs TBR shelves (I still have to input the TBR books from upstairs, on the big bookshelves) that I wondered if I would ever actually read all these books and if it was worth it to hold on to them? I own them all for a reason, either because I heard good things, they looked good to me, or because I liked previous books by the author. But I would have to take off at least 3 months to make a dent in this “pile” and that would be assuming I don’t collect any others (yeah, that will happen, I’m sure). Jaci felt my pain but didn’t offer any good advice on dealing with my problem, damn her. But back to the Book Collector. I’ve always wanted to keep track of my books but the idea of entering all the information by hand made my head hurt. 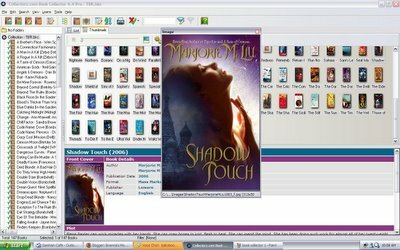 With this, all I have to do is enter the ISBN (either by hand or by scanning the barcode) and it searches the databases I tell it to–I have it set to search Amazon US and UK, Powell’s, Barnes and Noble and the Library of Congress–and not only grabs title, author, pub year, but also a blurb and the cover image. I’m going to share some screenshots (click on any of them to view in full screen size) so you can see what it looks like. 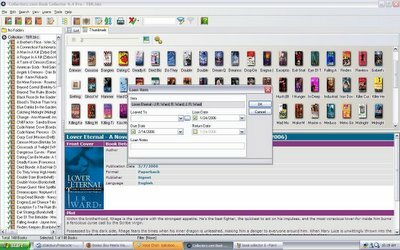 This is viewing the books as thumbnails on the main screen (you can also view as a list) and a list on the left sidebar. This is where you change the details of the book. 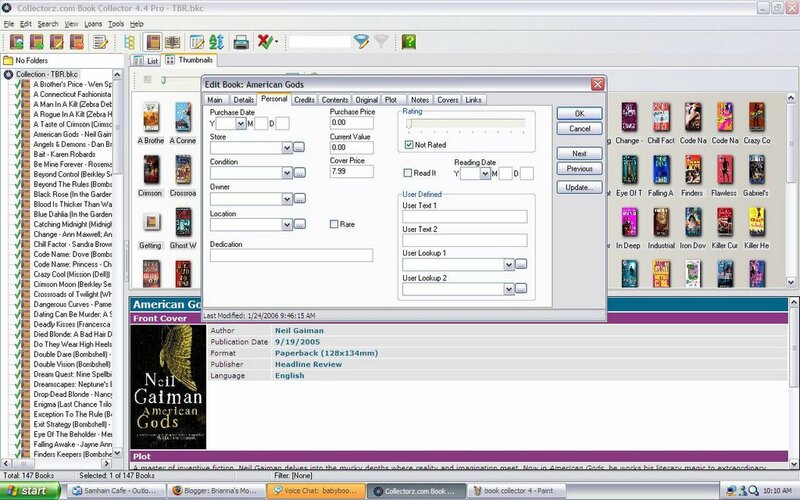 In this screen, you can see that you can assign your own genres to the books and since you can create as many genres as you want, you can get fairly specific. Then, I’ll show you how it will sort the books for you based on this. And here you can change your personal details about the book, when you bought it, the condition it’s in, if you’ve read, what you’d rate it. 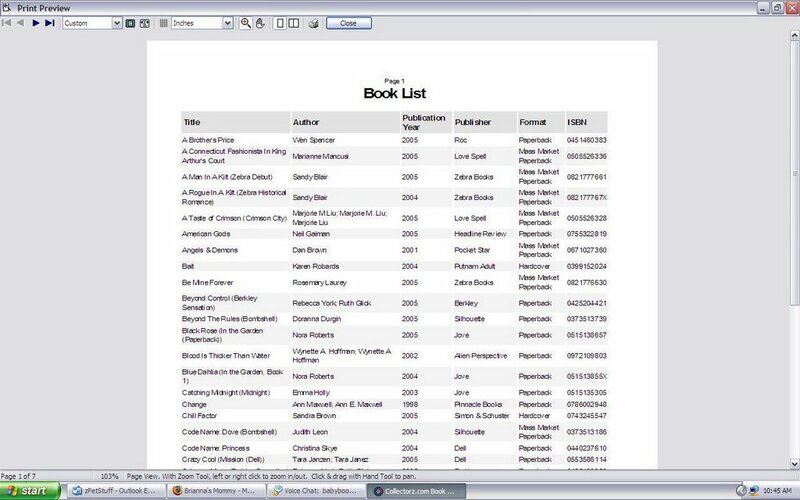 There’s also a screen to make notes on the book, add links (it will insert the links right to the book on whatever databases you’re searching, like Amazon, but maybe you want to add a link to your blog post about the book, or someone else’s blog post). 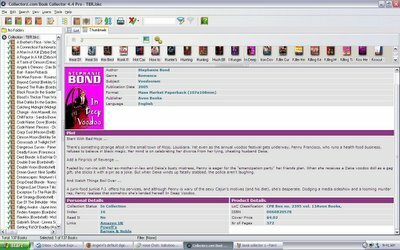 There’s also screens for tracking contents, characters–pretty much anything you want to track for your books, this program lets you do it. Here’s a view of the books as sorted by Genre. On the left is a list of my available genres right now, for the 150 TBR books I’ve put in. I actually added Silhouette Bombshells as a genre, because I wanted to be able to sort them and see what I had. 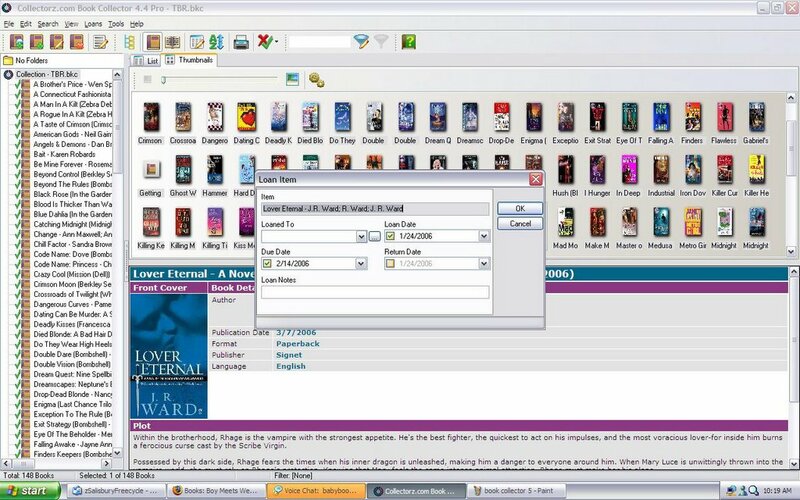 If you look in the upper left corner, you’ll see the drop-down menu showing other folders, so you can view your books by author, publisher, and other options, including user specified options. The last feature of Book Collector I haven’t mentioned is the ability to “loan” books out. You can track who you’ve loaned books to and set it to remind you if they’re “due”. I have lost so many books by loaning them out over the years. While I don’t do much loaning any longer, I still think this is a cool feature. Edited to add. I realized people would probably wonder if you could print lists of your books and the answer is yes. 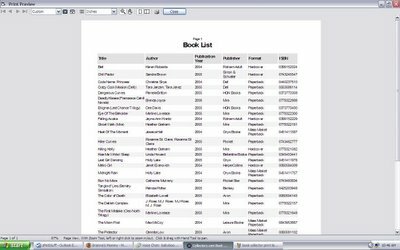 You can print all books, you can print them by folder, genre, author or whatever other grouping you select. You can also sort your print list by basically any setting you choose. And I do mean anything you can think of, not just author or publisher or title, but year published, characters, genres…anything. There are also other options for printing, a list method or a 40 per page method. 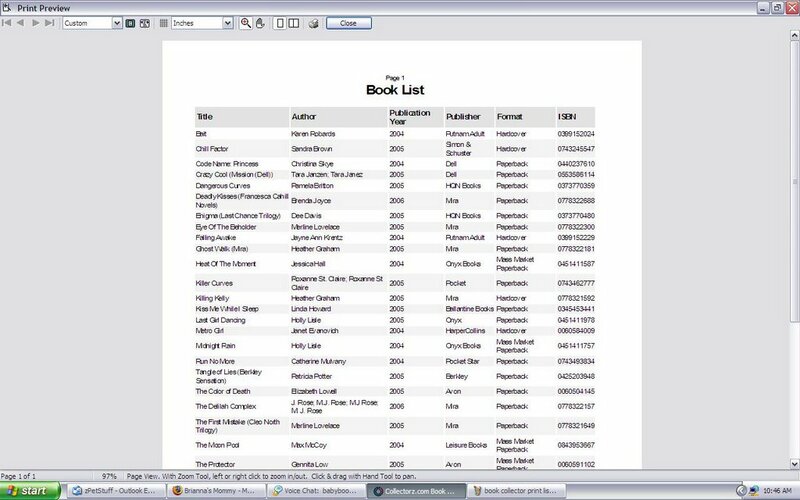 Two screenshots below show first the 40 per page method (I used all my books) and then the list method (I used my romantic suspense folder). The difference is basically that the list method scrunches them more on the page. 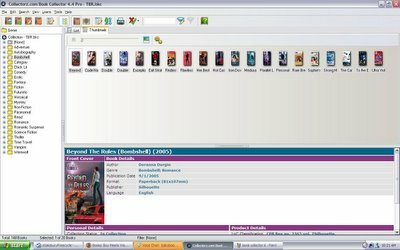 This program? Can you tell it’s awesome? I didn’t really think just describing it would do it justice, so I thought the added screenshots would go further in showing just how comprehensive the program is. 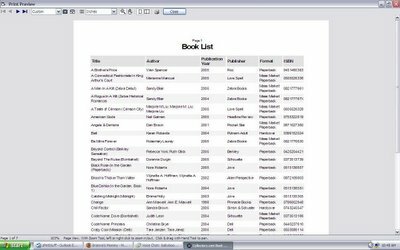 If you’re a book addict like me and looking for a way to track your books, I highly recommend this program and as well as a $15 barcode scanner (on ebay). It’s money well spent. I think for many readers it would earn its money back. Both by helping you track books loaned so you don’t lose track of them and also in helping prevent duplicate and triplicate purchases (yes, I’ve done this). Anyone have any questions about my new favorite program?